With our recent focus on security services for consumers we take a good, hard look at this provider in our ExpressVPN review for 2019. ExpressVPN is based out of the British Virgin Islands (BVI) and has long been one of the top VPN providers around. It has an excellent network of servers around the world and is as feature rich as you can expect. It has also been labelled by many as one of the more expensive VPN services. Defiantly not being a fan of free VPN services, we are also deeply distrustful of VPN service that are based out countries with heavy data regulation laws. This makes ExpressVPN an interesting case study and today, we dive in-depth with this ExpressVPN review to explore its full potential. Pricing – How Much Does ExpressVPN Cost? ExpressVPN Review Verdict: Highly Recommend! One of the main features of a VPN is that it should be able to help mask your identity. If it cannot do this, it’s would be like paying for a suit of Kevlar that won’t stop a bullet. That’s why almost all VPN will offer a no logging policy. Yet not all privacy policies are alike, and it is important to investigate the details. While ExpressVPN does have this in place, it is important to note that some things are logged. IN our ExpressVPN review process we find that it records a few details such as the servers you use, what time connections are made from your device and how much bandwidth you take up. It is important to note that key information is not recorded, such your IP address. Yet even the minor inconvenience of having some information recorded can be worked around. To circumvent this, we recommend that you subscribe to the service using their new .onion domain (Expressobutiolem.onion). You can access it using the TOR browser. Preferably, also pay for your account in cryptocurrency such as Bitcoin. As we mentioned earlier, ExpressVPN is based in the BVI. Some people might find this a cause for concern, but we assure you that despite being a British overseas territory, the BVI manages its own internal affairs. As such, it will be comforting to note that the BVI has no mandatory data retention laws. This means that the company really can do as it says – not retain user logs – legally. Even if by chance pressure were applied to the BVI government to get businesses there to release information, ExpressVPN cannot release information that it doesn’t retain. Companies in the BVI need only comply with BVI laws, not those of the United Kingdom. ExpressVPN offers a very potent combination of protocols and encryption standards; AES-256 and OpenVPN. This combination is strong enough to withstand almost any form of attack and almost impossible for attackers to decrypt information they might gain. The technicalities of it are slightly complicated, but the implications are not. This encryption level is still being used by some governments and militaries around the world to protect their assets. Although OpenVPN is the most commonly used, ExpressVPN also offers other protocols on some servers, including SSTP, L2Tp/IPsec, and PPTP protocols. There is a list you can reference to see which server locations support the various protocols. Suffice to say, this makes ExpressVPN very secure indeed. Some countries have extremely strict internet access regulations. To overcome this, ExpressVPN has dedicated a special group of servers to help, called Stealth servers. Technically, this could even help its users in China to overcome restrictions. 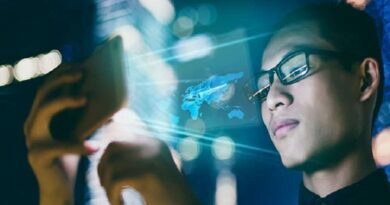 Stealth servers help combat government techniques deep packet inspection from knowing which connections are protected by VPN services. As far as we know, this is one of the reasons why ExpressVPN has servers in Hong Kong, but aside from that, not much else is known about the specifications of these stealth servers. Using some web tools, we also put ExpressVPN under the microscope for WebRTC and DNS leaks. These are common in the VPN industry and may end up exposing your identity. We found no evidence of leaks present, so there should be no issues in this regard. ExpressVPN also has what is becoming standard in many VPN service providers and that is the Kill Switch. This option will enable you to have the VPN client immediately cut off data transmission if it detects that your connection to the VPN server is lost. Their version unfortunately does not allow you to control the option at an application level, but rather you can choose to stop either all traffic, or to allow local traffic to continue and only disable remote transmission. During our ExpressVPN review process we found that the kill switch does indeed work as advertised. The moment we interrupted the VPN conenction, our data flow was cut off as well. Besides using the .onion site to sign up for ExpressVPN, the service in general also works with TOR. Although not necessary, choosing to go with this option beefs up your security considerably. TOR has long been renowned for security and making use of a VPN on TOR means that your traffic is encrypted multiple times over various servers. This can help maximize your security and makes you virtually untraceable under almost all conditions. With dedicated clients for all major platforms and support for almost anything else, ExpressVPN is highly versatile. You can use it on Windows, Mac, and Linux and even a variety of mobile platforms ranging from mainstream to things like the Amazon Fire TV Stick app. Not just that, but there are comprehensive guides to help you along as well. If you are still edgy about having to set it up, there are places online such as Flashrouters where you can buy a pre-configured router with ExpressVPN on it. *Note: VPNs require strong processor speeds in order to deal with the high level of encryption involved in the data streams that they handle. Routers typically have processors ranging between 1GHz to 1.8GHz and are not well equipped for high volumes of data encryption. Expect slow VPN speeds on most routers. 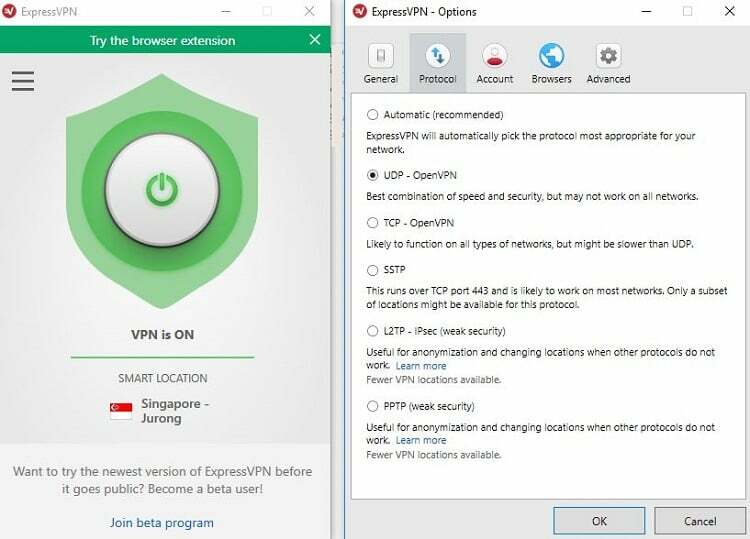 Aside from availability, ExpressVPN applications are simple to use, yet offer a great deal of features. For security purposes, you aren’t allowed to change encryption levels, but you can choose what protocols you wish to use, plus adjust many other settings. It is an unfortunate fact of life that any VPN connection will likely slow down your Internet speed. The main culprit is not always the VPN provider’s servers, but there are many other factors to consider, such as your actual line speed, the encryption used, distance from the VPN server and your own device. Thankfully, given how fast Internet lines are today, this isn’t likely to affect your surfing experience overly much. In our VPN speed test, our actual location is in Malaysia, so that will affect our speeds to countries further away. These test results should only serve as a guideline as to how much International speeds are affected by using ExpressVPN. To register a baseline, we ran a speed test without any VPN connection. Our line speed has an advertised 500Mbps up/down rate with an actual of roughly 341Mbps down and 299Mbps up. Physically located farthest form our test location, ExpressVPN’s US server performed surprisingly well. We were able to wring out a speed of 68Mbps down and 17Mpbs up. These are some of the fastest speeds we have gotten on a VPN connection to date. Further surprising us were the excellent results we managed to get from a London-based ExpressVPN server. At 70Mbps down and 24Mbps up, these were again some of the best we have gotten for a VPN connection to this region. Perhaps the most surprising of all were the results we got from the Africa server. We have in the past tested some Africa servers on other VPN providers, some of which we could not even connect to. ExpressVPN again came out trumps with an impressive 62Mbps down and 9Mbps up. Frequently chosen for our speed tests due to its excellent infrastructure, Singapore usually offers great speeds for our VPN tests. Although not topping the charts this time, we did manage to get a very impressive 86Mbps down and 105Mbps up. Our ExpressVPN review process did involve other Asia-based servers and for the most part, they all managed to show good ping rates and speeds. The land down under also showed good speeds with 73Mbps down and 43Mbps up. Certainly nothing to sneeze at considering that Australia is also quite a distance from Malaysia. In terms of line latency, it is obvious that the main factor affecting this is caused by distance, rather than the VPN server. From a near proximity latency (Singapore) of 11ms to a whopping 222ms for the US server, we doubt that using a VPN to overcome geolocation restriction for gamin would be very useful. However, we feel that across the board, line speed differences were quite marginal, ranging from 68Mbps to 86Mbps downstream. These speeds are more than sufficient to stream very high definition media content from probably anywhere around the world. We firmly believe that a product is only as the support that it gets from the company that owns it. Part of the reputation that ExpressVPN has in the industry is due to its sterling customer service reputation. You can reach out to them at any time for quick support either via live chat or the standard ticketing system. Responses were quick and usually, very helpful. Aside from that, ExpressVPN also has extensive resources to help you help yourself. Most standard issues can be overcome by digging through their knowledge base. It covers topics on a broad front and yet in many cases is very detailed. The best portion of their knowledge base is their comprehensive articles teaching you how to set up various types of VPN connections and for all the platforms you’ll probably ever need. With the excellent speeds we got from ExpressVPN as demonstrated earlier, it should come as no surprise that we had no issues either with P2P file sharing or media streaming in our ExpressVPN review. This VPN service provider certainly goes the extra mile in helping its customers get around geo-location restrictions in media streaming. Rather than relying only on the location of their VPN servers to do so, ExpressVPN also offers something called Smart DNS. This method changes your DNS settings to ensure any request you make for geo-restricted services are channelled top specific ExpressVPN servers. These servers do not make use of encryption and so allow much higher bandwidth for media streaming. We tested the service with both Netflix and the BBC iPlayer with no issues at all. P2 file sharing, or Torrenting, was likewise fast. You don’t have to connect to specific servers in order to Torrent. In fact, we recommend that you use the smart location option when connecting as that seemed to work fine for us in all cases. 6. Pricing – How Much Does ExpressVPN Cost? At the end of the day – everything must end in a price. As we have mentioned, there have been many instances where we found reviewers stating that ExpressVPN is a very pricey service, but somehow, we are forced to digress a little bit. In evaluating the price of a service, it is invariable that we are drawn to not just price, but also features and quality of service. When combining these factors, we find that ExpressPVN is extremely competitively priced for a top-tier VPN service provider. Monthly rates of $12.95 are around the industry norm for single-month subscriptions, as is the $9.99 per-month bi-annual rate ExpressVPN charges. At its longest subscription period of one year, the price drops to $6.67 per month, but you get a bonus of three months free with that. ExpressVPN also comes with a 30-day money-back guarantee, so that factors in to the appeal as well. 7. ExpressVPN Review Verdict: Highly Recommend! For those who have not experienced ExpressVPN before but have tried other services, we can only describe the experience as akin to driving a Toyota and not yet experiencing a Mercedes. Among the many VPNs we have tried out, this is clearly one of the best. It by far offers one of the most comprehensive and secure options in the field of VPNs and to be honest, is not priced overly high above the competition. True, there are cheaper alternatives such as NordVPN you might want to consider as well. Yet in comparison with most other VPNs, there is simply almost no area in which ExpressVPN lags behind. We would not hesitate to recommend ExpressVPN to any level of user. Had it for years. Definitely my favorite VPN.